Mark Cerny is a brilliant mind. He had his hands in the design and development of many of PlayStation’s most beloved games and was the lead architect on the PS4 and Vita. He was also the director on PS4 launch title Knack and returns to direct the second. When I learned that I would be sitting down with Cerny one-on-one for my presentation of Knack 2, I was ecstatic. Sure, I may have been critical of many aspects of Knack, but it’s because I saw so much potential in picking from the classic action platforming feeling of games like Jak and Daxter, Ratchet and Clank, Spyro the Dragon, and Crash Bandicoot, all of which Cerny played a critical role in development. Knack 2 is the opportunity address those criticisms and make the Knack I think people will love, possible. There’s an increased variety across the game in both combat and platforming, as well as more puzzles and some special gameplay moments like driving a tank. Cerny took me through examples of each of these and even offered some hints into the plot, which seems to pay off on a lot more of the breadcrumbs that are left about. In fact, Marianne Krawczyk, who wrote the entire God of War series, is the co-writer on Knack 2’s story. The delivery of the narrative through animation and voice acting remains high quality, making Knack 2 feel like yet another playable Pixar or Dreamworks Animation movie. One of the major criticisms from the first was a limited move set. 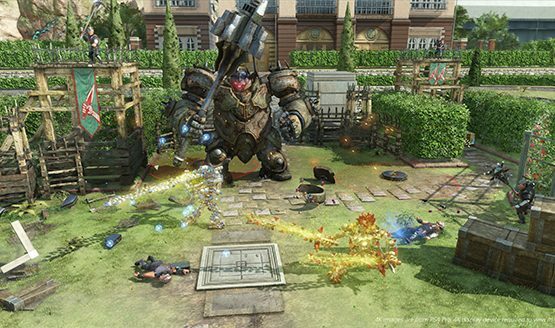 Knack 2 adds new moves, combos, abilities, and a skill tree that allows players to upgrade moves that fit their particular style of play. Cerny and the team are very aware of the feedback and even poke fun at themselves as Knack learns a new move. “I can’t believe you saved this world, all you have is three punches and a kick,” a warrior monk tells Knack as he is given a new super punch. That kind of self-referential treatment tells players that their voices have been heard and these changes are for them. There are also new gameplay mechanics that assist with more complex platform puzzle design. Knack can now drop and return his parts at will. Many segments and secrets require a smaller Knack to stand on a ledge or get through a narrow passage. Once you are through, you can call the parts back to return to Knack’s current full size. Knack’s health is directly proportional to his size though, so dropping parts may put you at risk for death. There’s also environmental interaction, like dragging objects around, which is nothing new to games but is entirely new to Knack, giving the team yet another tool to create more interesting puzzle platforming segments. The difficulty was something I felt was handled right in Knack. Easier modes made for a fun and casual game while harder ones created a near insurmountable challenge. It was nice to see both sides of the spectrum approached, and Knack 2 continues this trend. Instead of only increasing combat difficulty though, separate difficulties may actually affect the puzzles and paths, meaning easier modes open up shortcuts so you won’t have to navigate challenging platforming sections should you choose. 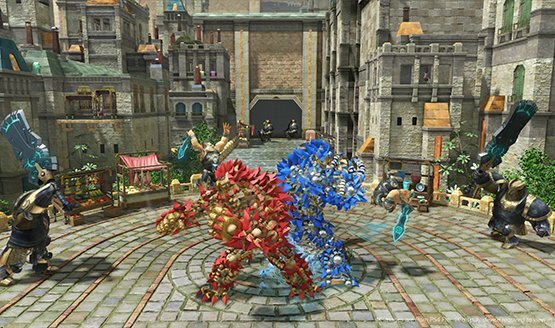 Co-op is a huge focus for Knack 2, and though the first one had the ability for a second player to play, it could often feel like only one player was needed in many parts of the game. 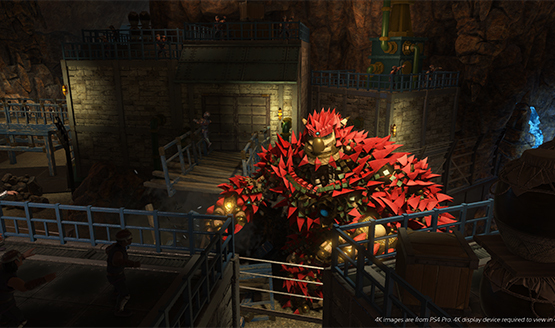 Knack 2 takes every moment and applies a co-op flair to it, so for example if there are any QTE sequences, both players will need to press the buttons. It even answers why there is only one Knack in the story by effectively saying that the co-op Knack is just a part of the main Knack, and during cutscenes, he is shown to be made up of both red and blue parts (the color of the second player) to show that both players are now Knack. It’s a clever and effective way of resolving questions that may arise about it. “You’ve really doubled-down… tripled-down even, on feedback from the first,” I said as the demonstration ended with three minutes to spare for formal questions. “Reviews, boards, tweets. I mean you’re not going to get the most detailed analysis of the shortcomings of the game in a tweet, but hearing in a tweet that more platforming would be welcome, that’s great feedback. We’ve really tried to be responsive.” Cerny tells me that they’ve taken feedback from wherever they could to iterate and improve going into Knack 2. I’m excited to say that I’ve had the pleasure of sitting down and playing some Knack 2 co-op with Mark Cerny himself, and even more pleased to say that Knack 2 is shaping up to be a great action platformer, addressing the problems I had with the first head on. Perhaps the most exciting part is the soft-spoken passion that Cerny clearly has for Knack, and his willingness to accept criticism, revisit the series and strengthen its features for a much-improved experience. That kind of humble dedication is an admirable trait that will serve to make better games for everyone. A huge thank you to Mark Cerny for taking time out of a very busy E3 to show me Knack 2. Knack 2 releases on September 5th, 2017 exclusively on PS4. Check out more of our E3 2017 coverage.